So that stomach virus that’s been going around lately? Yeah, it hit our house. But I am the only one who got it, which I *suppose* is a good thing in a house full of 7 people! It’s been so difficult to feed the kids properly, let alone eat myself. But this protein pancakes recipe just may be my saving grace. So easy and healthy at the same time – great for any time of day when you are recovering from GI issues but also a really quick and healthy breakfast for the kids in the morning when it seems there is never enough time for a proper meal. With only three ingredients, you can send the kids off to school with a protein-packed start to their day, rather than rely on carb-heavy convenience of cereal. We mix our week up between gluten-free oatmeal, and this recipe that takes five minutes to make! Our family was grain-free for a few years. And we are vegetarian. So, we know first hand about being creative in the kitchen. This recipe was an absolute blessing in the mornings before school. 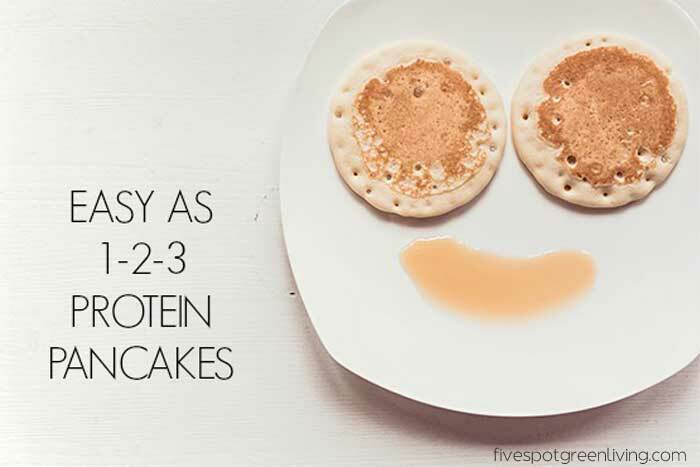 Leftover pancakes can be packed into lunches for an energy boost during the day. Our daughter enjoys them hot or cold. In a blender, blend all three ingredients for sixty seconds. Lightly warm frying pan with oil of your choice. We alternate between coconut oil or ghee. Pour blender batter onto pan to form wee pancakes. Flip after a minute or so, to cook other side. I would never have guessed the ingredients looking at the picture! I love that these are packed with protein instead of starch. Thanks so much for linking up your recipe at This Is How We Roll Thursday.